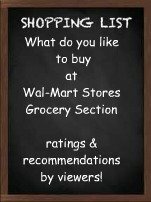 Now that Wal-Mart has groceries too, please share what food related items you like to buy at Wal-Mart and see what others are buying as well. Feel free to share your recommendations for dry goods, frozen foods, or private label items. If you have a recipe to share with a particular item that you buy at Wal-Mart, we'd loved to have you share that too! Do You Like To Buy From Wal-Mart? What are good deals or great food related products or ingredients to buy at Wal-Mart?